The porch's pole on the right and its curved angle brace. The wood carving is very elegant. The centered door flanked by two vertical rows of small windows. This gorgeous home reflects the emergence, in the Georgian architectural environment, of certain features specific to the traditional "Canadien” house. It was built in 1823. First, note the disappearance of a second floor. The kind of skylight in the middle of the roof is a late addition. It is therefore a one-story house, with a pitched roof prolonged by eaves that cover a beautiful porch, a spectacularly "Canadien" element. The roof is of cedar shingles. 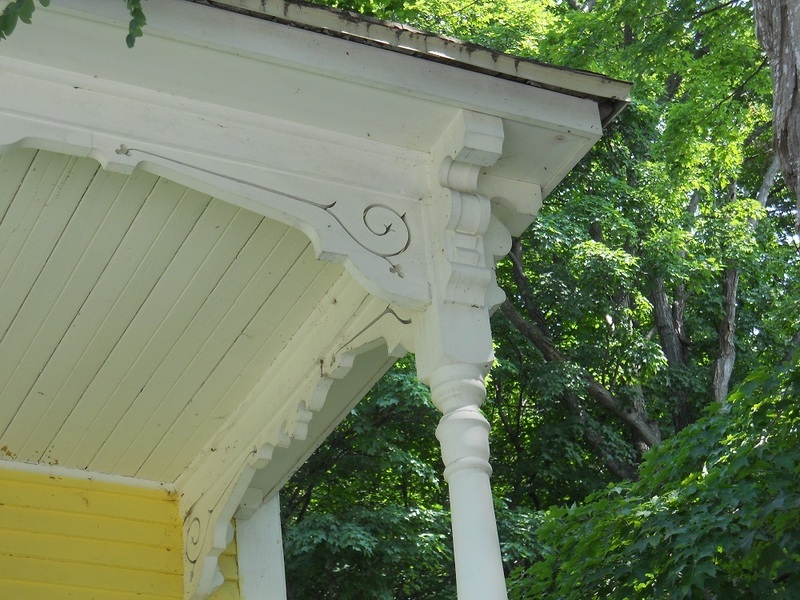 As "Canadien" as it is, the roof, atypically, does not include furrings, those wooden pegs placed beneath the eaves, giving the roof that Canadien-style elegant curvature. These furrings guide the flow of water and snow away from the house. Here, as in Georgian homes, there are none. Note the centered door, bordered on both sides by rectangular ten-paned windows, reminiscent of the Georgian manner of construction. The exterior walls are made of wood shingles. Unlike typical "Canadien" houses, generally propped up on their extremely high foundations, this one is just slightly elevated and only in front, as the back follows the natural slope of the hill. 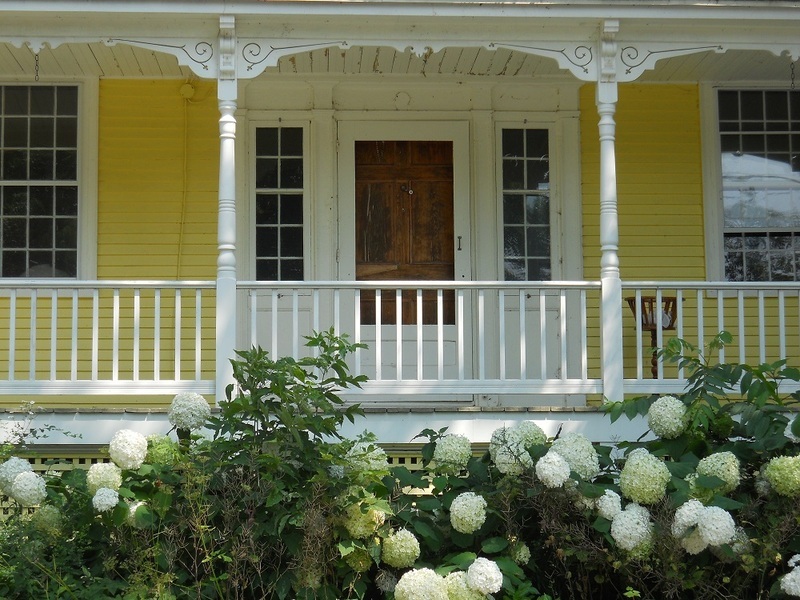 The decoration of the porch, which covers the entire width of the facade, contributes much to the charm of this house where Anglo-Saxon and Canadian elements intermingle. The wooden porch poles are turned. Their tops are adorned with cubic capitals supporting curved angle braces. 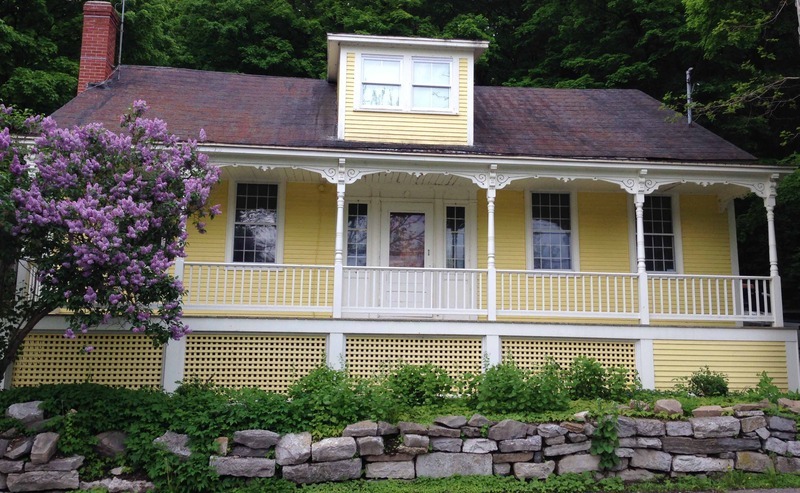 What we have here is a rare example, in an Anglo-Saxon milieu such as the early nineteenth century Eastern Townships, of a Canadien-style house, so prevalent elsewhere in Quebec and that will dominate the rural scenery during the whole 1800s.